Match action from Solihull Barons' defeat to Billingham Stars. Picture by Steve Crampton. SOLIHULL Barons got their new NIHL North Division One campaign off to a slow start with a narrow 5-4 defeat to Billingham Stars. 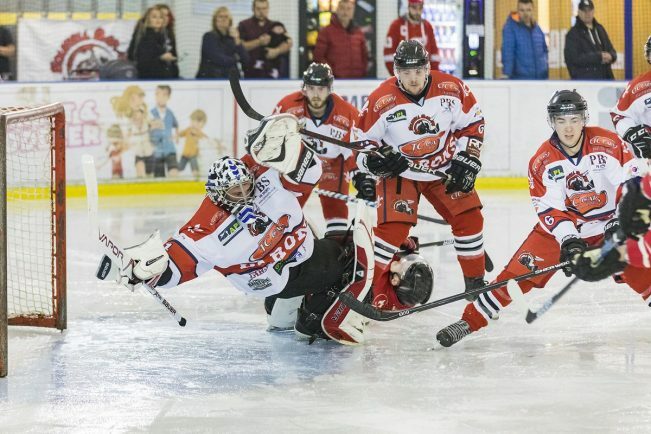 The first five minutes of the game was played almost exclusively in the Barons end with the visitors continually testing the Solihull defence and netminder Sam Hewitt. After eight minutes the visitors would make the most of a late-hit penalty called on Barons captain Josh Bruce when James Moss flicked the puck over Hewitt’s blocker for the evening’s opener. The Barons would get more into the game as the period went on – Josh Bruce, Filip Supa and Niklas Ottosson all with opportunities, while tempers flared as pleasantries were exchanged between Solihull’s Andy Whitehouse and the Stars’ Cain Taylor on 15 minutes. The scoreboard would, however, continue to show the visitors a goal to nil up as the sides hit the dressing rooms. If the first period had been a bit stingy on the scoring, then the same could not be said of the second. After two minutes in the visitors had extended their lead, with Jack Davies leading a three-on-one breakaway for number two and Edgar Protchenko making the most of a wide open back door to shoot over a sprawled Hewitt for goal number three. Almost immediately after this Niklas Ottosson got the Barons opener before Josh Bruce brought the Barons back to within a one goal deficit with a neat effort, biding his time while skating across the Stars goal mouth for Solihull’s number two in the 27th minute. The visitors struck back quickly, however, as Chris Sykes poked the puck through Hewitt’s pads to ease out the Stars’ cushion once more and leave the Barons two goals behind as the final 20 minutes approached. The final period began well for the Barons as Dan Harrison on the powerplay jabbed the puck in from inches in a crowded goal crease to trim the Stars advantage to a single goal. This cushion was then wiped out on the 48th minute as gritty solo play from Luke Brittle got the Barons equal, the Solihull forward waiting for Billingham netminder James Flavell to commit before picking his spot for number four. Home hopes of at least a point would be dashed as Ethan Hehir for the Stars picked up a rebound on 51 minutes for what would be the final goal of the night. A line brawl in the final three minutes gave Barons a net powerplay once the penalties had been balanced out but there sadly would be no opportunity to turn this into something more tangible. Barons entertain Nottingham Lions on Sunday.